Intense sunlight in the stratosphere (above 12 km) produces bluish colored ozone (O3) by naturally breaking down normal oxygen molecules (O2) into two highly reactive oxygen atoms (O). Each oxygen atom then quickly bonds with an oxygen molecule to form ozone. Ozone absorbs UV radiation, and in the process ozone is changed back into an oxygen molecule and an oxygen atom. A balance exists in ozone destruction and production, so that an equilibrium concentration exists in the stratosphere. This equilibrium has probably existed throughout much of geologic time. Recently, however, an ozone hole has been detected in the stratosphere over Antarctica, presumably due to the atmospheric build up of ozone-destroying CFCs by humans. Ozone depletion has resulted in a greater penetration of ultraviolet radiation on the earth's surface, which is harmful to life on earth because it damages cellular DNA. The ozone effect does not appear to have a direct influence on global temperatures. Certain gases, called greenhouse gases (primarily carbon dioxide and water vapor; but also methane, N2O, and CFCs), allow short wavelength radiation from the sun (UV and visible light) to penetrate through the lower atmosphere to the earth's surface. These same gases, however, absorb long wavelength radiation (infrared), which is the energy the earth reradiates back into space. The trapping of this infrared heat energy by these greenhouse gases results in global warming. Global warming has been evident since the beginning of the Industrial Revolution. Most scientists attribute global warming to the release of greenhouse gases through the burning of fossil fuels. Suspended particles, such as dust and ash, can block out the earth's sunlight, thus reducing solar radiation and lowering mean global temperatures. The haze effect often generates exceptionally red sunsets due to the scattering of red wavelengths by submicron-size particles in the stratosphere and upper troposphere. Volcanic eruptions can enhance all three of these climate effects to variable degrees. They contribute to ozone depletion, as well as to both cooling and warming of the earth's atmosphere. The role of volcanic eruptions on each climate effect is described below. The halide acid HCl has been shown to be effective in destroying ozone; however, the latest studies show that most volcanic HCl is confined to the troposphere (below the stratosphere), where it is washed out by rain. Thus, it never has the opportunity to react with ozone. On the other hand, satellite data after the 1991 eruptions of Mt.Pinatubo (the Philippines) and Mt. Hudson (Chile) showed a 15-20% ozone loss at high latitudes, and a greater than 50% loss over the Antarctic! Thus, it appears that volcanic eruptions can play a significant role in reducing ozone levels. However, it is an indirect role, which cannot be directly attributed to volcanic HCl. Eruption-generated particles, or aerosols, appear to provide surfaces upon which chemical reactions take place. The particles themselves do not contribute to ozone destruction, but they interact with chlorine- and bromine-bearing compounds from human-made CFCs. Fortunately, volcanic particles will settle out of the stratosphere in two or three years, so that the effects of volcanic eruptions on ozone depletion are short lived. Although volcanic aerosols provide a catalyst for ozone depletion, the real culprits in destroying ozone are human-generated CFCs. Scientists expect the ozone layer to recover due to restrictions on CFCs and other ozone-depleting chemicals by the United Nations Montreal Protocol on Substances that Deplete the Ozone Layer. However, future volcanic eruptions will cause fluctuations in the recovery process. Volcanic eruptions can enhance global warming by adding CO2 to the atmosphere. However, a far greater amount of CO2 is contributed to the atmosphere by human activities each year than by volcanic eruptions. T.M.Gerlach (1991, American Geophysical Union) notes that human-made CO2 exceeds the estimated global release of CO2 from volcanoes by at least 150 times. The small amount of global warming caused by eruption-generated greenhouse gases is offset by the far greater amount of global cooling caused by eruption-generated particles in the stratosphere (the haze effect). Greenhouse warming of the earth has been particularly evident since 1980. Without the cooling influence of such eruptions as El Chichon (1982) and Mt. Pinatubo (1991), described below, greenhouse warming would have been more pronounced. Volcanic eruptions enhance the haze effect to a greater extent than the greenhouse effect, and thus they can lower mean global temperatures. It was thought for many years that the greatest volcanic contribution of the haze effect was from the suspended ash particles in the upper atmosphere that would block out solar radiation. However, these ideas changed in the 1982 after the eruption of the Mexican volcano, El Chichon. Although the 1980 eruption of Mt. St. Helens lowered global temperatures by 0.1OC, the much smaller eruption of El Chichon lowered global temperatures three to five times as much. Although the Mt. St. Helens blast emitted a greater amount of ash in the stratosphere, the El Chichon eruption emitted a much greater volume of sulfur-rich gases (40x more). It appears that the volume of pyroclastic debris emitted during a blast is not the best criteria to measure its effects on the atmosphere. The amount of sulfur-rich gases appears to be more important. Sulfur combines with water vapor in the stratosphere to form dense clouds of tiny sulfuric acid droplets. These droplets take several years to settle out and they are capable to decreasing the troposphere temperatures because they absorb solar radiation and scatter it back to space. Observational evidence shows a clear correlation between historic eruptions and subsequent years of cold climate conditions. Four well-known historic examples are described below. LAKI (1783) -- The eastern U.S. recorded the lowest-ever winter average temperature in 1783-84, about 4.8OC below the 225-year average. Europe also experienced an abnormally severe winter. Benjamin Franklin suggested that these cold conditions resulted from the blocking out of sunlight by dust and gases created by the Iceland Laki eruption in 1783. The Laki eruption was the largest outpouring of basalt lava in historic times. Franklin's hypothesis is consistent with modern scientific theory, which suggests that large volumes of SO2 are the main culprit in haze-effect global cooling. TAMBORA (1815) -- Thirty years later, in 1815, the eruption of Mt. Tambora, Indonesia, resulted in an extremely cold spring and summer in 1816, which became known as the year without a summer. The Tambora eruption is believed to be the largest of the last ten thousand years. New England and Europe were hit exceptionally hard. Snowfalls and frost occurred in June, July and August and all but the hardiest grains were destroyed. Destruction of the corn crop forced farmers to slaughter their animals. Soup kitchens were opened to feed the hungry. Sea ice migrated across Atlantic shipping lanes, and alpine glaciers advanced down mountain slopes to exceptionally low elevations. KRAKATAU (1883) -- Eruption of the Indonesian volcano Krakatau in August 1883 generated twenty times the volume of tephra released by the 1980 eruption of Mt. St. Helens. Krakatau was the second largest eruption in history, dwarfed only by the eruption of neighboring Tambora in 1815 (see above). For months after the Krakatau eruption, the world experienced unseasonably cool weather, brilliant sunsets, and prolonged twilights due to the spread of aerosols throughout the stratosphere. The brilliant sunsets are typical of atmospheric haze. The unusual and prolonged sunsets generated considerable contemporary debate on their origin.They also provided inspiration for artists who dipicted the vibrant nature of the sunsets in several late 19th-century paintings, two of which are noted here. In London, the Krakatau sunsets were clearly distinct from the familiar red sunsets seen through the smoke-laden atmosphere of the city. This is demonstrated in the painting shown here of a sunset from the banks of the Thames River, created by artist William Ascroft on November 26, 1883. 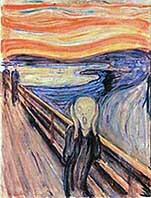 The vivid red sky in Edvard Munch's painting "The Scream" was inspired by the vibrant twilights in Norway, his native land. For a more thorough description of the 1883 eruption, see Krakatau. PINATUBO (1991) -- Mt. Pinatubo erupted in the Philippines on June 15, 1991, and one month later Mt. Hudson in southern Chile also erupted. The Pinatubo eruption produced the largest sulfur oxide cloud this century. The combined aerosol plume of Mt. Pinatubo and Mt. Hudson diffused around the globe in a matter of months. The data collected after these eruptions show that mean world temperatures decreased by about 1 degree Centigrade over the subsequent two years. This cooling effect was welcomed by many scientists who saw it as a counter-balance to global warming.